Lawmakers debated a measure April 4 intended to address retirement system pension obligations for employees in the Omaha Public School District. 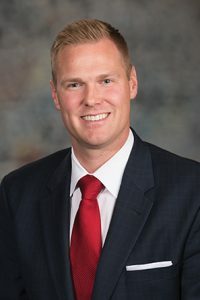 LB548, as introduced last session by Omaha Sen. Brett Lindstrom, originally would have consolidated the Class V (Omaha) School Employees Retirement System (OSERS) with the School Employees Retirement Plan beginning in 2020. 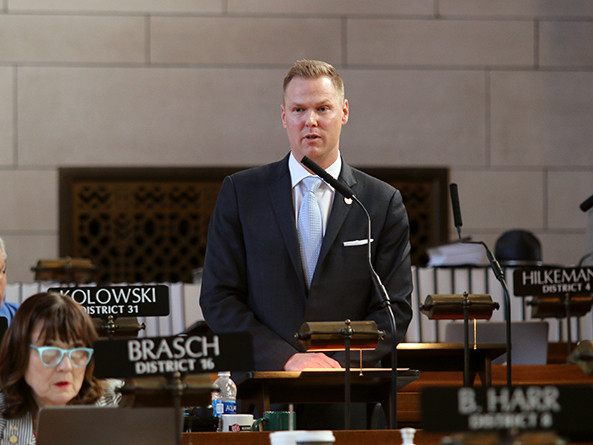 Lindstrom proposed an amendment this session that instead would expand the bonding power of school districts in Nebraska to include bonds to address retirement system pension obligations in an amount determined by an actuary. He said that OPS currently is facing actuarially required contributions to OSERS in the tens of millions annually to address the plan’s unfunded liability to its members. Without action, he said, those payments are expected to increase to about $45 million annually—and total approximately $900 million—over the next 30 years. A Retirement Systems Committee amendment would replace the bill and authorize any school district to issue pension obligation bonds for payment of obligations to the retirement system without a vote of the electorate. Payment for pension obligation bonds would be from the school district’s general fund and included in general fund operating expenditures. Pension obligation bonds would be issued within the $1.05 property tax levy lid. The amendment would require that the Omaha Public Schools district contribute a total of $300 million from a pension obligation bond to OSERS on or before Aug. 31, 2019. Lindstrom said the injection of $300 million into OSERS would allow the Nebraska Investment Council to “unravel” previous bad investment decisions made by OPS and the OSERS board. A different asset allocation of those funds would give the system a chance to achieve the 7.5 percent rate of return on investment necessary to close the unfunded liability gap, he said. It also would stabilize the actuarially required contribution payments at approximately $20 million per year, he said. Lowering ARC payments in the short-term would produce millions in long-term savings for Omaha taxpayers, he said, and allow OPS to schedule predictable yearly payments. Omaha Sen. Tony Vargas supported the amendment. While not a “silver bullet,” he said the ability to issue a pension obligation bond would be another tool for OPS to use—in addition to budget cuts that they already are making—to deal with the problem. “By issuing this bond under the current levy, which is not new debt … it would allow stability and more predictability in the payments that would be required,” he said. Seward Sen. Mark Kolterman, chairperson of the committee, said he agreed to have the amendment debated on the floor although he opposed its adoption. Issuing the pension obligation bond would tie the hands of future OPS administrations, he said, by allowing them to use only .93 cents of their $1.05 levy. Kolterman said a better option to address the $713 million in unfunded liability would be to attempt a levy override, which would require voter approval. Sen. Lou Ann Linehan of Omaha also opposed the amendment. OPS already has extensive debt, she said, and taking on more is not the solution to the district’s problems. The state currently pays more than $300 million in state aid annually to OPS, she said, yet the district is failing its students. OPS passed a bond a few years ago close to $500 million, she said, and is set to have a $400 million bond on the ballot in May. No banker would agree to another $300 million in bond debt, she said. “They are $700 million behind on their retirement program, they’re almost another $1 billion in debt and they’re talking about cutting staff and building schools,” Linehan said. The committee amendment failed on a vote of 22-17. Following nearly three hours of debate, the Legislature moved on to another item on the agenda. Per a practice implemented last year by Speaker Jim Scheer, the sponsor of a bill that is facing a potential filibuster must demonstrate sufficient support for a cloture motion before the measure will be scheduled for additional debate.